Cyril James Smith OBE (11 August 1909 – 2 August 1974)was a virtuoso concert pianist of the 1930s, 1940s and 1950s, and a piano teacher. Cyril Smith 1909-1974 Born here in Costa Street, Cyril Smith began to play the piano at the age of 4 and gave his first concert in Middlesbrough Town Hall at the age of 11. in 1927, he won a national piano contest and met his future wife, Phyllis Sellick. He lost the use of his left arm in 1956 after a stroke. 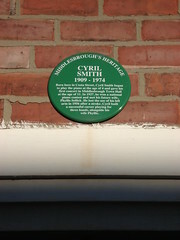 Cyril built a successful career playing for three hands, alongside his wife Phyllis.